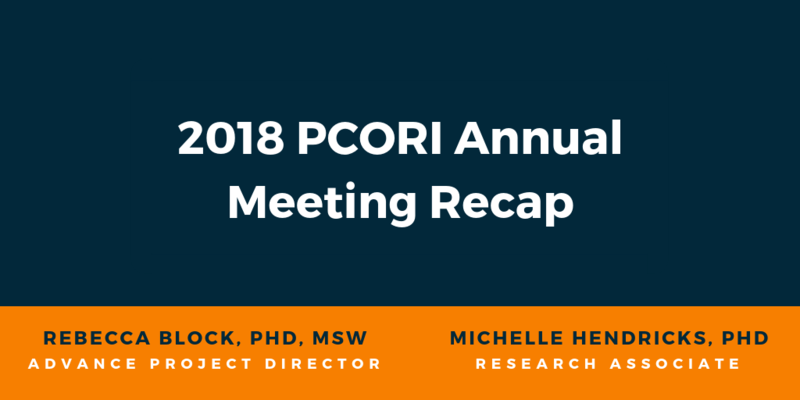 This year, over 1,000 people, including ADVANCE Project Director, Rebecca Block, PhD, MSW, and OCHIN Research Associate, Michelle Hendricks, PhD, met in Washington D.C. for The 2018 PCORI Annual Meeting. The event surely delivered providing a star-studded agenda and three days of thought-provoking and inspiring content around this year’s theme, From Evidence to Impact: Putting What Works into Action. Amy Berman, Senior Program Officer of The John A. Hartford Foundation, opened the meeting with her personal story of living with Stage 4 breast cancer. She spoke of building care from the foundation of what is important to patients and also of her work, her life, and what needs to come next in the field. Her talk encouraged each of us to think about the care we deliver, the research we do and the roles of each of us as patient, clinician, researcher and advocate. Ms. Berman’s talk was followed by specialty sessions on content areas such as opioids, telemedicine and decision-making sessions regarding the future of PCORI. Evening receptions on both Wednesday and Thursday were filled with lively discussions about posters. Both the Collaborative Research Group and Health Systems Demonstration Project posters were popular stops for interesting conversation. Dr. Rebecca Block presented on the culmination of the work of the Health Disparities CRG this past year: a formal list of recommendations on how to improve data readiness for research investigating health disparities. Created over several months from focus groups, meetings, and writing sessions, the recommendations were actionable items building upon the work of the Malone-Heckler Report, Institute of Medicine’s Unequal Treatment: Confronting Racial and Ethnic Disparities in Health Care and the ACA. The CRG poster gave audience members a peek into the process of developing the recommendations and suggestions for how to continue improving data readiness for health disparities research. Dr. Michelle Hendricks presented a poster called “Health Systems Demonstration Project: The impact of clinical and social complexity on diabetes control.” The poster provided an overview of the previous HSD project’s results along with what is planned for the next phase. In the previous phase, the team looked at the impact of patient-level clinical comorbidities and neighborhood-level social deprivation on glucose control (HbA1c) in a safety net population of patients whose data was pulled from the ADVANCE and OneFlorida CDRNs. Results showed a small association between social deprivation and glucose control, but given the very high level of social complexity in the sample, the actual association may be much larger. To address this, in the next phase the team is partnering with Kaiser Permanent’s PORTAL CDRN to develop a patient sample with a broader mix of social complexity, with the goal of increasing the generalizability of the results to a larger population of patients. The conference was brought to a close with a truly outstanding keynote from Dr. Mark Smith of the California Health Care Foundation on patient engagement, empowerment and measurement. He highlighted the positive outcomes demonstrated in medicine when patients are in the driver’s seat, when patients self-monitor and receive the care they specifically need in ways that are meaningful and accessible. For instance, in Great Britain, high risk hypertensive patients who self-monitored their own blood pressure and self-titrated their own medications based on the results had significantly better outcomes than those who received treatment as usual. Similar results have been found for patients who managed their anti-coagulation condition and even those who conducted self-dialysis. Dr. Smith’s talk highlighted the wealth of capacity for coproduction in patient care, and provided another opportunity to circle back on the impact of this year’s meeting with system-level perspectives of the power of evidence in action. Overall, the ADVANCE team is grateful for another successful PCORI Annual Meeting and the opportunity to convene with like-minded members of the healthcare community.